Basing on the process of making traditional “Do” paper of Vietnam, Bamboo material is used to replace bark of “Do” material; combining with other creation methods to make artful paper works named “TRUC CHI”. “TRUC CHI”; can be understood as “TRUC” means bamboo and “CHI” means paper, which means papers made from bamboo. However, “TRUC CHI” is not just the name but the spirit that makes the difference, and makes “TRUC CHI” is no longer just a type of paper made ​​from bamboo. So, What “TRUC CHI” can be? Can “TRUC CHI” be a kind of paper? Can “Truc chi” be a difference of papermaking technique? Can “Truc chi” be the lowest level paper in the papermaking technique? Can “Truc chi” be “the Addition and the return”? Can “Truc chi” be a mean of plastic medium instead of oil paint, lacquer...? Can “Truc chi” stand independently as an artwork? Can “Truc chi” be commercial products? Can “Truc chi” be a way of storytelling? There are a lot of perspectives and starting points to approach a new concept. If understood literally, directly and briefly, “TRUC CHI” is nothing more than a type of paper made ​​from bamboo, a popular material in Vietnam and many parts of the world. The use of bamboo as a raw material to make paper is also nothing new under the sun. And paper is only paper! It is just the transshipment base of the desire called creation or merely just recording. “TRUC CHI” is beyond that concept. If “TRUC CHI” is considered as a new strange way of original papermaking technique, it's like waking up the curiosity and stimulating the sad pride that we still have not removed such as "the first time ..." largest in Vietnam... which is a matter of autism records. Because technique is still technical and technique is just results drawing out from failed experiments, which mankind has experienced thousands of years... the problem is what we use the techniques for, to make what , and for whom? “TRUC CHI” is not merely a technique concept. Can “Truc chi” be the lowest level paper in the papermaking technique or not? Perhaps “TRUC CHI” will never be the top one, even the lowest or highest, because we still have not known what can be compared with it. If it is toilet paper, we can compared “An An” with “Sai Gon”, which are toilet paper branches. With printing paper for computer, we can compare Viet tri paper with AAA paper. “TRUC CHI” is now beyond the boundaries of the familiarity. For the creation awareness: creation results come from immanent and urgent demand of human being, for human being. Certainly, it can not be denied or negated the achievements of the past, but we must know to add more, refresh, and light it up under a new light ... to create new values​basing on the past. By adding in new ideas, new perspectives, combining with other values ​​... we totally can think of a new and unique result, but still close with our mind and our country. Of course, it can’t exclude the addition of values outside the region, country or area ... This might not be a concern for quite a long time, leading to the self-enclosed, self-destructive or the poor of quite many other traditional values. For the awareness of sharing, community: New values built need the understanding and support of community to be able to develop and bare national and humanity characteristics. However, this is not easy- psychology of inferiority complex, cowardice and low self-esteem ​​ ... that makes some parts of people always have the reaction of fears, wariness, cautious, indifference or sneering at what are outside themselves, not themselves, or do not have familiar signs - including new values in different fields. (The low self-esteem leads to two response: Firstly is: the cowardice and considering ourselves not belong to those values, considering it as something that we can not participate into, secondly is: the conceit, which considers them as normal or even trivial ones, using their own knowledge as a measure for the values that they have not completely understood-or being indifference, or saying: "Oh, they have made them for a long time ago!" So, in creation, enjoying with indifferent attitude is the first enemy, which is manifested by the lack of intelligence and soul. The share of viewers, whether they praise or make little of or give sincere comments, all of them are a source of positive energy for next creation steps. In creation and the awareness of sharing, community, this Return bears the meaning of the energy continuity from trips with traditional values ​​of culture and humanity ... in order to extend and renew those values ​​in the current time – to make new values ​​formed but still bear the breath of the past, as an addition to thicken values of new creation which parallel and build up toghether with the past, not corrode the past. Can “TRUC CHI” stand independently as an art work? Our viewpoint is: Nothing is a substitute in creation, but it is the parallel, because throughout it is still the continuation and addition. If there is replacement, there is an exception, however, the subtraction is totally not allowed to be here, in the spirit of creation in general and “TRUC CHI” in particular. The papermaking was previously only considered as a handicraft, its products were used, for the other purposes, other areas, including arts, such as: writing, drawing, printing, ect but paper and papermaking have never been considered as the art, or been raised to the same level with the arts. “TRUC CHI” with the creative spirit, not repeating, always searching ... can totally be an independent art work. Thousands of “TRUC CHI” papers have been made completely different, each sheet of “TRUC CHI” after leaving the frame is already an art work. When combining with the effects of light, installation ... or with other art branches such as Embroidery, Painting, Printing, Calligraphy ... “TRUC CHI” will bring more resonance beauty that may not be touched the final margin. The answer is: Yes, totally possible, and not just for one person, region .... totally can create jobs for many people, may even be something to identify them! 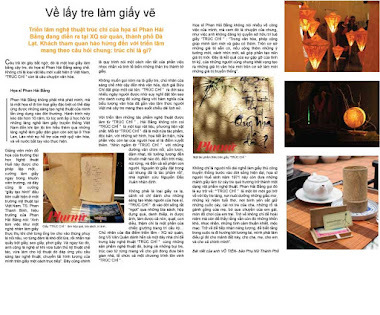 If “TRUC CHI” can be linked creative energy with Vietnamese ​traditional handicraft values, we can fully imagine the handmade products bearing unique, creative Vietnamese cultural characteristics which are valuable to not only people from other countries but also to the awareness of Vietnamese people, as a pride of Vietnam even though it is very small. “TRUC CHI” is not only a commercial product, it hopes that it will carry on it all the values, culture, humanities, nation, ect. Yes, a way of storytelling, a story of a Vietnamese who desires to change a new perspective to see Vietnamese Bamboo trees in a new light, a new life, the story of arduous efforts and achievement of creation and sharing ... to find a private way next to huge values which have been confirmed, in order to help develop the pride of Vietnamese culture in the world and Vietnam. A research and creation project by artist Phan Hai Bang- Lecturer of The College of Arts, Hue University. Starting the research since 2000. Starting production testing in 2010 at the College of Arts, Hue University. 2011: “A new day” Exhibition- New Space Art Foundation. 1. Bamboo trees are peeked burned, chopped into small pieces, and soaked into lime water for 1 night. Combine with other materials: Leather, thread, bronze, silver, bamboo, wood ... to produce unique “TRUC CHI”​ products. Production process of "Trúc Chỉ"
Trải nghiệm cùng "Trúc Chỉ" tại vườn "Trúc Chỉ"